Simply Lovely Ideas: What comes first...the clock or the frame? What comes first...the clock or the frame? Too many choices! The first one from Ballard is the original clock that I wanted. I really can't find anything close to that clock so I started going in a different direction. Now I'm trying to decide whether to go with an "antiquey" feel for a clock or a clean, crisp white clock. 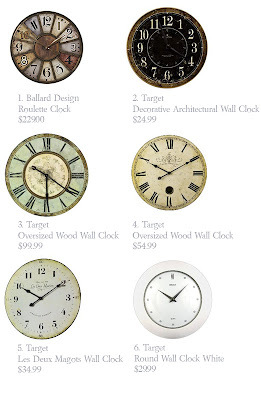 I don't really like the white Target wall clock but it has a similar feel for the direction that I am headed. Tough call...and this is just a clock! Perhaps once I decide what I'm going to do for frames the clock will fall into place. Did they ever decide whether the chicken or the egg came first?